TIMELINE: HOW DID CRIME IN TALLAHASSEE GET SO BAD IN THE FIRST PLACE? TALLAHASSEE, FL- Tallahassee’s violent crime problem has gotten so bad under Andrew Gillum that even his own former chief of staff is campaigning against his failed record. However, the real question is: How did it get so bad in the first place? TIMELINE: HOW DID TALLAHASSEE’S CRIME PROBLEM GET SO BAD? Note: The City of Tallahassee’s fiscal year begins on October 1. Andrew Gillum served as a city commissioner from 2003 to 2014 and was elected mayor in 2014. From 2009 to 2013, public documents show that Andrew Gillum and the Tallahassee City Commission repeatedly ignored pleas from law enforcement for help with a growing crime problem. Also beginning in 2009, the murder rate began to trend upward. 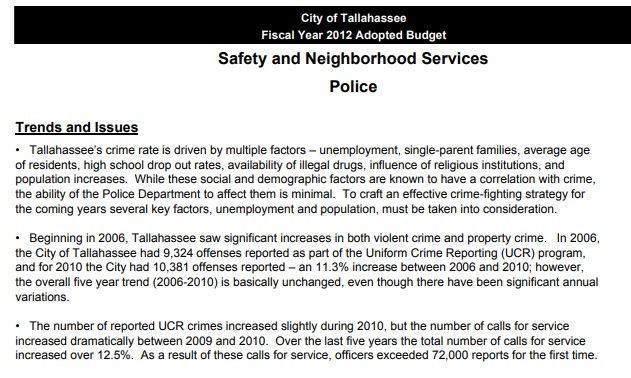 By 2017 the murder rate in the City of Tallahassee was higher than rates in Miami and Orlando. 2009: During the 2010 budget cycle, police officials informed upper management and the city commission that staffing was an issue. “Over the last several years, the Police Department’s staffing level has not kept pace with population growth, workload, or staffing increases recommended by two (2) in-depth staffing studies.” Source 2010. 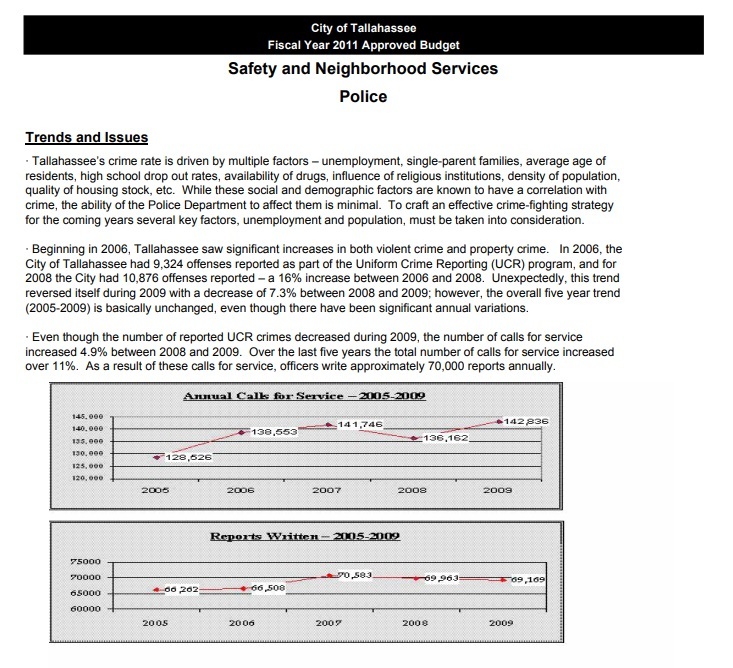 2010: During the 2011 budget cycle, the police department reported that, “Even though the number of reported crimes decreased during 2009, the number of calls for service increased 4.9% between 2008 and 2009. Over the last five years the total number of calls for service increased over 11%. As a result of these calls for service, officers write approximately 70,000 reports annually.” Source 2011. 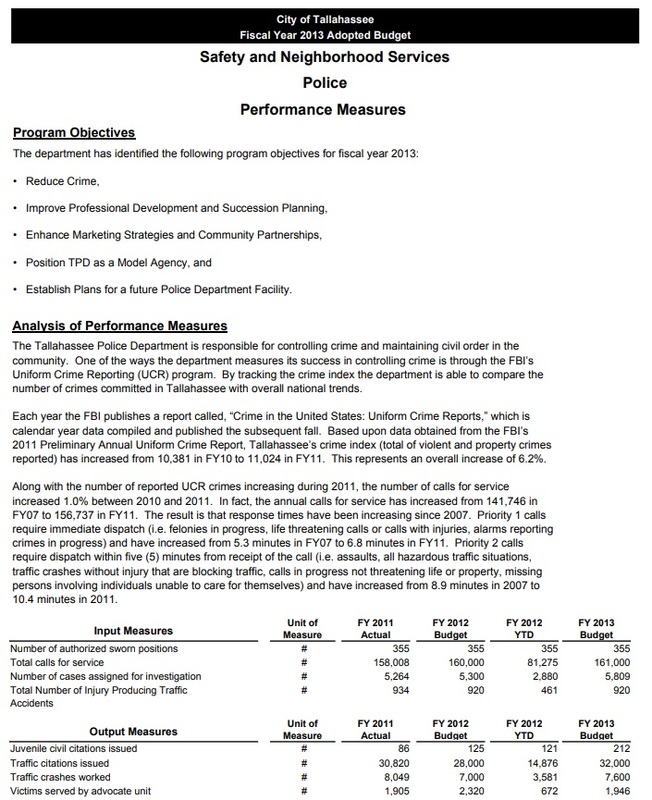 2011: During the 2012 budget cycle, the police department informed upper management that, “the number of reported crimes increased slightly during 2010, but the number of calls for service increased dramatically between 2009 and 2010. Over the last five years the total number of calls for service increased over 12.5%. As a result of these calls for service, officers exceeded 72,000 reports for the first time.” Source 2012. 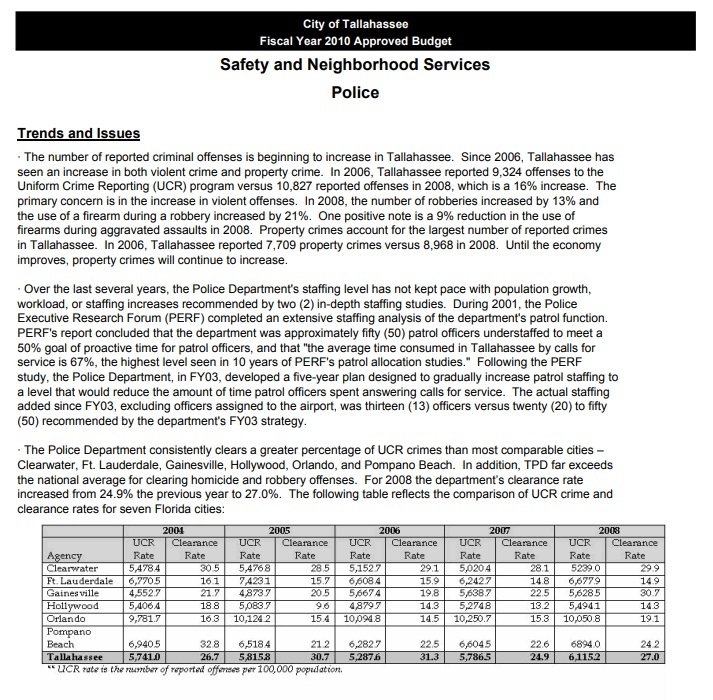 2012: During the 2013 budget cycle, the police department reported that: “data obtained from the FBI’s 2011 Preliminary Annual Uniform Crime Report, Tallahassee’s crime index (total of violent and property crimes reported) has increased from 10,381 in FY10 to 11,024 in FY11. This represents an overall increase of 6.2%. Along with the number of reported UCR crimes increasing during 2011, the number of calls for service increased 1.0% between 2010 and 2011. In fact, the annual calls for service have increased from 41,746 in FY07 to 156,737 in FY11.” Source 2013. 2013: During the 2014 budget cycle, Gillum and the Tallahassee City Commission declined to approve a Tallahassee Police Department request for five new police officer positions to address the crime problem. 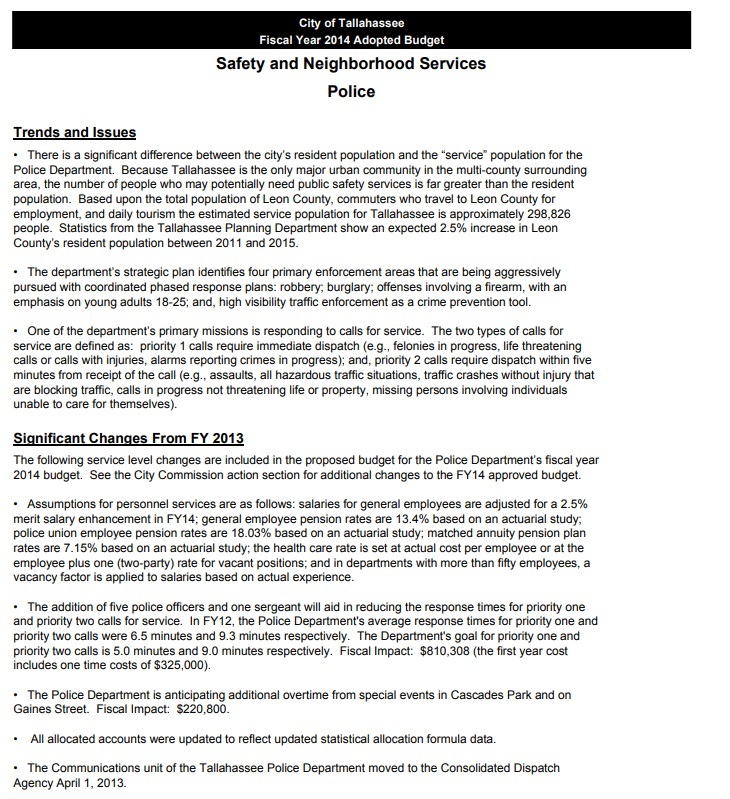 During the 2014 budget cycle, the police department asked for more police officers. The request stated: “The addition of five police officers and one sergeant will aid in reducing the response times for priority one and priority two calls for service.” Source 2014A; Source 2014B. 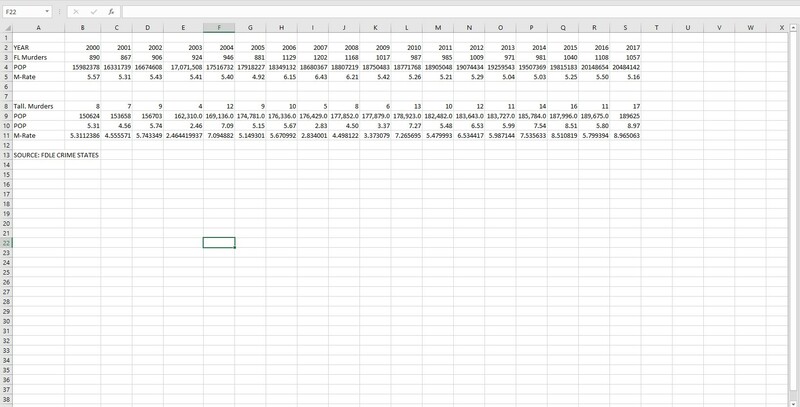 Additional Context on Murder Rate: From 2002 to 2009 the average murder rate per 100,000 citizens in Tallahassee was 4.6. During this period there were 63 murders, an average of 7.9 murders per year. However from 2010 to 2017 the average murder rate increased 52 percent to 7.0 murders per 100,000 citizens. During this period there were 104 murders, an average of 13 murders per year. Source Crime Stats.